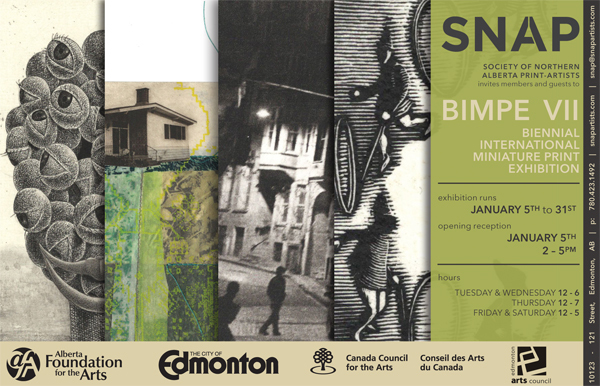 This Biennial International Miniature Print Exhibition has already been shown in Vancouver twice and will go to Kelowna before closing. If you’re in Edmonton, please come. I have some work in it. I have been working with solar plates in Calgary at Alberta Printmakers, but have only a small light box to work with and am having a lot of trouble getting consistent results. I understand that you are ‘the’ solar person in Alberta and I was hoping to hire your expertise for a session at SNAP where I could learn to use their exposure unit ( we have nothing here that is publicly available). I would bring transparencies and hopefully be able to work a few hours with you at whatever rate you would charge for one to one sessions. I spoke briefly to the person at SNAP who told me that you travel a lot but if you could let me know when you are back in Edmonton I am fairly flexible and if you are interested we could arrange a time. i also use Akua inks…. Thanks very much and I look forward to hearing from you…. I’d be happy to work with you at SNAP. Please email me at slnorquay@yahoo.com. I will be free to arrange something with you next week.